When we redecorated our Mumbai apartment, José and I used the services of a professional interior designer, who helped us merge the old with the new. If we had to do this again, and we might with another home, we have a lot more experience and ideas that we will incorporate. Decorating is fun, especially the joy of having a home that reflects your personality. Today, I’m happy to have Pat Sava share his 3 tips for decorating the perfect apartment. 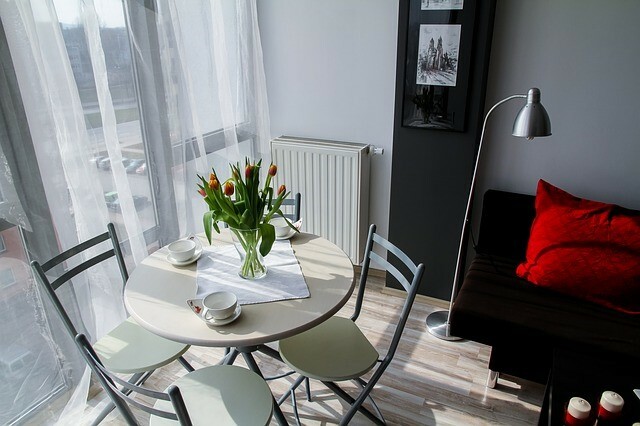 Whether you’re living in a luxury apartment like the ones at http://ownatlantic.com/ or in an average apartment in an up-and-coming neighborhood, you’ll need some decorating tips to make the place look absolutely perfect and suited to your particular tastes and style. So take heart in knowing that you can have the perfect apartment if you just decorate it the way you like the most. You can live in a luxury apartment, your average and ordinary apartment, or even a rundown tenement – although this certainly isn’t recommended. You can still fix it up and make it look beautiful. Let’s take a look at some decorating tips to help you create the beautiful masterpiece known as your incredible apartment! If your apartment is small and cramped, there really isn’t much you can do to make it bigger, but you can certainly make it look bigger. It’s easy to do as long as you use the right colors while you are decorating the place. Yes, you should paint the walls with light colors to create the appearance of a room looking brighter and bigger. You should also use light-colored rugs on the floors to get the same effect. Again, it’s impossible to make your apartment feel bigger unless you actually knock down walls and add an extension. But you’ll certainly change its appearance if you use the suggestions just mentioned. So stick with light colors if your apartment is small and it will certainly look brighter and bigger after all’s said and done. With this tip, we want you to begin focusing on the positive aspects of your apartment during the decorating process. Stop harping on the areas of the apartment that you don’t like much and focus on enhancing the areas of the apartment you absolutely love and adore. By focusing on the positive, you’ll be able to turn your creative decorating energy into something fun, bright, and beautiful for your living space. This will obviously make you feel great about your new living arrangements and it will help you transition into your new apartment much more smoothly. Do you want to put a new sofa in your apartment? If you have the money, then you should absolutely go for it. Pick a fun design that you’ll fall head over heels in love with. If money is tight, begin saving up or see if you can buy a new couch on credit, but only buy it this way if you can afford to make the monthly payments. Do you love decorating with antique furniture? Maybe it’s time to begin sprinkling your apartment with antique clocks, chairs, tables and more. If it’s something you find positive and fun, then you should definitely consider decorating your apartment this way. These purchases can also be very cheap since vintage furniture can be found in thrift stores or flea markets where you’ll get them at a bargain. Do you like your floors? Maybe you have hardwood floors but prefer rugs instead. Or maybe your floors are old, ugly, and outdated, and you’d do anything in your power to cover them up. Using throw rugs or putting in brand new carpeting in your apartment might be just what the doctor ordered. So, pay close attention to the floors. If you are unhappy with them for any reason, or feel rugs are the better option, you should absolutely go for it and put them in your brand-new apartment as you continue with your decorating. Use these tips to decorate the perfect apartment. Before long, you’ll have a beautiful living space that you absolutely adore. Pat Sava is an influencer marketing pro with brownboxbranding.com who is passionate about building authentic relationships and helping businesses connect with their ideal online audience. He keeps his finger on the pulse of the ever-evolving digital marketing world by writing on the latest marketing advancements and focuses on developing customized blogger outreach plans based on industry and competition. Nice post, Corinne! A house reflects its inhabitants and so it is very important it should be done according to their likes and dislikes. Our designer was against our using different colours for every room, but we wanted it and went with it. The result – we have turquois blue paint in our room and we love it even after 5 years! I too follow the same notion – we should decorate our place the way we like the most. It should reflect our taste, personality. I like more ethnic decor but at the same time I like abstract too. Its contrast but I tried to maintain a balance of both at my place. It is amazing what a fresh coat of light paint can do! Great tips. I would add to be sure to have items that mean something to you as focal points or as decorative cluster. Family photos or an urn or painting, but something that is part of you! Love the idea of rugs and painting to adorn the apartment. The concept of creating space sounds super interesting and painting in various colors do give a unique, personalized shade to good living. That’s more a seat, I think, Sunita. Rightful insight… specially when me and my better half were discussing the ways to refurbish the children’s room to meet the growing demands of their ever growing ages! Glad you found them useful, Anagha.